And the most important thing is not simply to involve your pieces in the play randomly, but with some useful purpose. This can be called “teamwork” or, technically, “piece coordination”. So you need to understand that piece coordination is very important and can be very effective in your games. You may already know him from his previous lessons that you can find on our YouTube channel here: LINK.Also, he is the author of our latest chess opening course, the “Bogo-Indian Defense” (LINK). It’s White’s turn now. Do you think that White’s pieces are well placed? What is the BEST continuation for White? 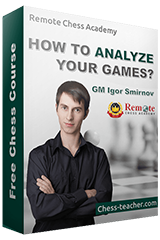 That interest ing dear Igor I know even Kasparov had 6 private coaches like vladimirov to help him in preparation.